Brick pavers are available in a variety of aesthetically pleasing shapes, sizes and colors that gives your home an impressive appearance. But pavers are exposed to harsh weather conditions that can damage them. And grease, dirt, and oil can get inside the porous material making it difficult to clean. With our eco-friendly brick paver sealing solution, you can maintain its like-new appearance for years to come. 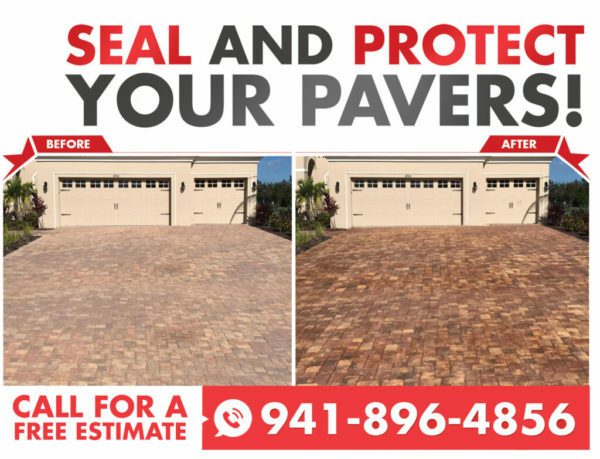 Our trained Brick Paver Sealing professionals will make your surfaces shine in Bradenton FL! It’s easy to clean – Our custom sealing solution locks out water, dirt, oil and stains from penetrating deep into the pavers. Simply wash the surface with a hose and water to clean. It looks shiny – Our brick paver sealing dries into a clean and shiny surface with a signature “wet look” that homeowners love. Paver Investment Protection – Sealing your pavers protects your original investment and extends the durability of your surfaces. Stops Weeds & Mold – Weeds, mold and algae can grow in between the joints of unprotected pavers. Sealing pavers prevents unsightly growth and maintains your curb appeal. Prevents Sinking Pavers – Our water-based (non-acrylic) solution seals the pavers and joints preventing them from shifting, eroding or sinking into the ground. Unsealed pavers accumulate dirt and grime which can penetrate deep into the porous brick surface. They stain the pavers making it very difficult to clean. Also, heavy rains can wash away the sanded joints that hold the pavers in place. And moisture can also cause the bricks to soften, crack and even dislodge from the surface. Our sealant wraps the brick pavers in a non-acrylic shield that prevents water, dirt and other deposits from damaging the pavers. Simply wash the pavers with water is all that is necessary to rinse away any surface particles. 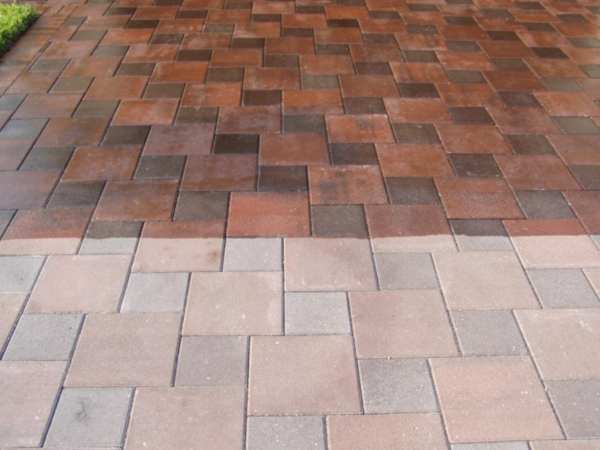 Before applying our customized sealing protection, our trained and certified technicians use a mild detergent with a high-pressure system and warm water to safely remove dirt, oil and fungus that have accumulated on the brick pavers and sanded joints. A broom and wet sanding nozzle will fill in any missing gaps in the sanded joints. 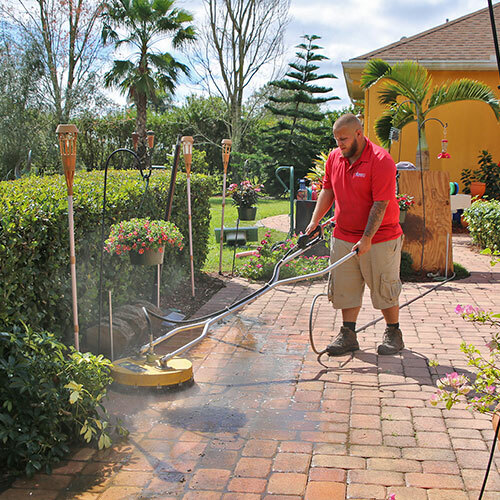 This deep-cleaning process alone will make your pavers look like new again and improve the appearance of your home in Bradenton. Once the brick paver surface has been completely cleaned, a certified technician applies our customized Brick Paver Sealing solution with Seal ‘N Lock technology to maintain its shiny appearance. This is water-based (“non-acrylic) formula will maintain its streak-free shine for up to three years. Plus, your sealed brick paver surface is dry and ready for use within hours of application. Once sealed, your brick pavers will have that clean, shiny signature (“wet look”) that homeowners desire. 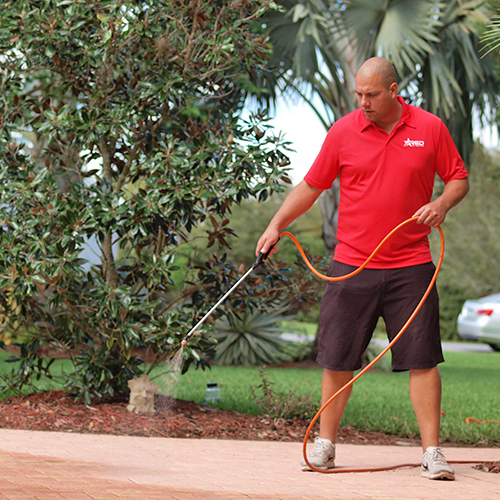 Our certified technicians use a water-based eco-friendly solution that shields the surface without damaging the pavers. And it’s safe for both pets and plants. Also, brick paver sealing protects your driveway, walkways, patios, pool and other surfaces from fading and discoloration caused by the sun’s UV rays. And since it also repels stains and prevents efflorescence, it will maintain its like-new appearance making it easy to maintain your home’s curb appeal. Weed growth on your patio, driveway or walkway is unsightly that not only detracts your paver’s appearance, but it can also damage them. This is because unwanted weeds and grass grow mostly in the sand joints between the pavers. This erosion can weaken your pavers leading to expensive repairs. Sealing the pavers will prevent weed and grass from growing and attracting pests. Use our brick paver sealing every 3 years to maintain condition. Red Hot Services Brick Paver Sealing provides long-lasting protection for up to 3 years. It will provide protection from fading and discoloration, and resist water, weeds and fungus from ruining your surfaces. To maintain its shiny, signature (“wet look”) simply rinse the pavers with water to remove any dirt or debris from the surface. Then reseal your pavers every three years for maximum performance and durability.